Vitamin A Benefits: Vitamin A is the vital vitamin for growth, development and for the maintenance of the immune system and good vision. Vitamin A cannot be made by the body itself and must be taken in form of food. For example, carrots and liver are both rich in vitamin A. It is very useful for and cell growth. Vitamin A is a group of unsaturated nutritional organic compounds, that includes retinol, retinal, retinoic acid, and several provitamins, and beta-carotene. Let’s see some of the amazing health benefits of Vitamin A here on this page. Vitamin A is a broad group of related nutrients. Each of these nutrients provides us with health benefits. It is found in animal products such as meat, fish, poultry and dairy foods. Besides, the other type, pro-vitamin A is found in plant-based foods such as fruits and vegetables. Specifically, the most common type of pro-vitamin A is beta-carotene. Eggs, carrots, meat, cheese, liver, fish oil, Cream, kidneys, Fish liver oils, Beef Liver, Egg yolk, Cheddar cheese, Fortified milk, papaya, broccoli, peaches, apricot, avocado, melon. Sweet potato, Carrots, Pumpkin, Cantaloupe, Broccoli, Apricots, Spinach, and collard greens, dark leafy greens, winter squashes, lettuce, dried apricots, cantaloupe, bell peppers, fish, liver, and tropical fruits. Vitamin A to ensure optimal functioning of your eyes. This fat-soluble vitamin can keep your eyes healthy by stop progressive deterioration of retina and maintain your eyesight. It is very useful for and cell growth and bone development. It also has antioxidant properties that neutralize free radicals in the body that cause tissue and cellular damage. It fights cell damage, but it also has many other uses. Vitamin A has an important role in the normal formation and maintenance of the heart, lungs, kidneys and other vital organs. 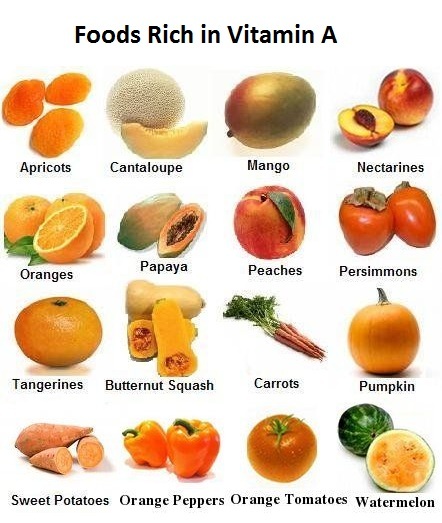 Vitamin A benefits: It controls malignant cells in your body and really helps in preventing several forms of cancer. Too little vitamin A is dangerous to health. Furthermore, the people who do not get enough of the vitamin may lose the ability to see in poor light and suffer from a weakened immune system. They may also have problems with memory because vitamin A is important for the brain. Vitamin A deficiency is the most common cause of blindness among children. Vitamin A can prevent night blindness and dry eyes while also ensuring clear vision.